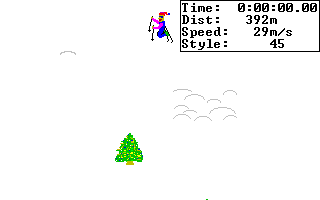 This is SkiFree, a game that was released on Windows Entertainment Pack in 1991 with copies of Windows 3.1 (?) It took up a slight 100-something KB and came preloaded with every Windows machine in the early 90s. It was one of many such games we got for free back then, and one of the few that were loaded on the machines in my elementary school’s computer lab. SkiFree is the only game out of all those early 90s freebies that anyone remembers, and people remember the hell out of it. But why? SkiFree is an extremely basic game where you point your ski man down a slope and he skis. You can move him around with the arrow keys on your keyboard. If you’re so inclined you can do low jumps off of hills (represented by half-circles) and high jumps off of ramps (shown as rainbow-colored bars, for some reason.) This isn’t necessary, but it’s fun. SkiFree features sweet tricks such as this one. You aren’t alone on the slope. Your nameless skier is joined by annoyingly slow, crappy skiers and annoyingly fast, skilled snowboarders. There are also dogs that sometimes piss on the snow (seriously, this happens.) All of these, including the stationary trees and rocks that populate the slope, are obstacles for your skier to avoid. Not that it matters all that much if you hit them: you’ll just fall over and get back up. Sometimes the tricks don’t work out. Left: tree, rock, a snowboarder. There’s something else that lives on the slope, but if you don’t know what that something else is then I won’t spoil it for you. Go play the game. The creator’s official SkiFree website is here. He seems like a cool guy, even aside from the fact that he gave me a fun diversion to play in my school’s computer lab when I was six years old. For some reason, SkiFree has become a part of modern internet culture. Not a massive part, but a part. It must be the power of nostalgia at work. New games are great and all, but we also like to think about the games of our distant childhoods, even if it turns out they weren’t very good, objectively speaking. Luckily, SkiFree was pretty good for what it was: a fun, innocent two-minute break from the tedium of school or the office. My school computers didn’t have this game installed. What a shame. I would have enjoyed it more than Minesweeper.